East London - The Eastern Cape Top Green Organisation awards were celebrated on the 17th of November at The Venue, Hemmingways Hotel. Honourable MEC Mr S. Somyo from the Department of Economic Development, Environmental Affairs and Tourism, delivered the message of the day, "the awards bear testimony to the incredible work done by both public and private enterprise". The biennial awards aim to recognise the efforts of those who invest in maintaining best environmental practice. Entrants are applauded for finding innovative solutions to reduce their carbon footprint and for educating their surrounding communities about responsible resource management. The award categories include large organisations, medium organisations and small organisations. Sub categories are measured according to environmental impact. This year The Waste Trade Company maintained their position in first place for medium organisations with a low environmental impact. Furthermore, they won a platinum award for scoring above 90% for their environmental audit. They also shared their success with four of their clients, Goodyear SA, General Motors South Africa, Bridgestone South Africa and Kabega Primary, who also received awards for their environmental efforts. Howard Bulkin, owner of The Waste Trade Company, commended the efforts of all who were involved in achieving these accolades, "we are proud of the role we play in the success of our clients, we believe that teamwork is of utmost importance in achieving our clients' goals. We are very proud of our platinum award, which serves as confirmation of the standards that we adhere to." In the large organisations with high risk, Goodyear SA won 1st place and received a platinum award. Freddy Xoli accepted the award. Goodyear SA has maintained their zero-to-landfill status since 2008. GMSA won second place in the same category. The platinum award was accepted by Huldah Solomon. Laura Vorster from Bridgstone accepted the gold award for winning 3rd place in the category for medium organisations with a high environmental impact. The top recycling school in Port Elizabeth, Kabega Primary, won first place in their category. The award was accepted by Dr Adele Botha. Dr Botha and her team of Groenspoor Prefects have set a stellar example with regards to implementing an environmental policy at school. 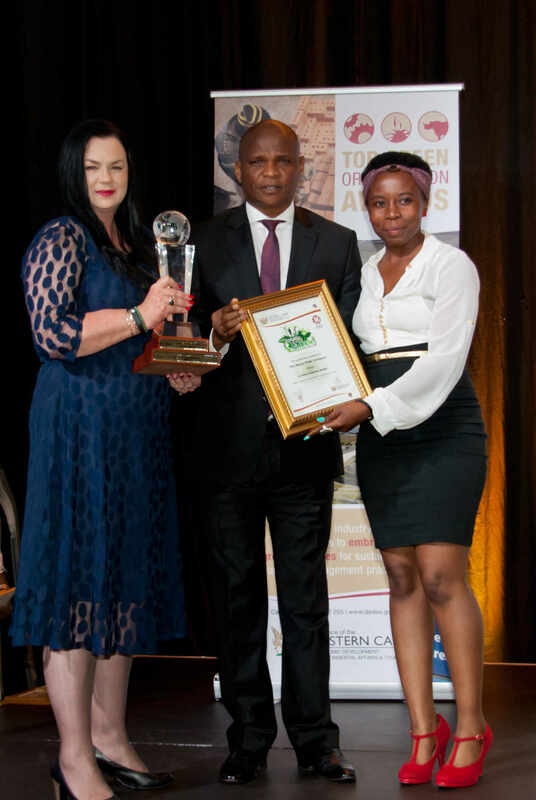 Deidre Nxumalo-Freeman, lead auditor, presented the awards for the evening, "The Eastern Cape Top Green Organisation Awards has given entrants the opportunity to measure their environmental impact, and even more so, to explore opportunities for improvement. We can clearly see the positive impact in the audit scores of our top winners."